With apprehension, Caleb looked away from the Oldster, to see the rising dust cloud over the mountain’s rocky crest. The horsemen were coming for him. How could they raise such dust on a rocky mountain? Shaking his head, Caleb forced this question down. No distractions. Focus. He was standing on a mountain. Rock! Could he really be feeling the ground shake from those things, those horses hoofbeats? Damn it! His mind fought to betray him with needless, needling questions. He had to focus on the here. The Now. The Moment. It was the horses with the Oldster. They pawed the ground in anticipation. It was their impatient hooves that rumbled the mountain. “Your wish is now, Caleb,” the Oldster intoned with deep gravity. His wish: Caleb was closer than ever before to his wish. The very presence of the Oldster proved this. Caleb’s wish would come true: Immortality. But the Oldster grants the wish with a price. Not all are worthy of their dreams. 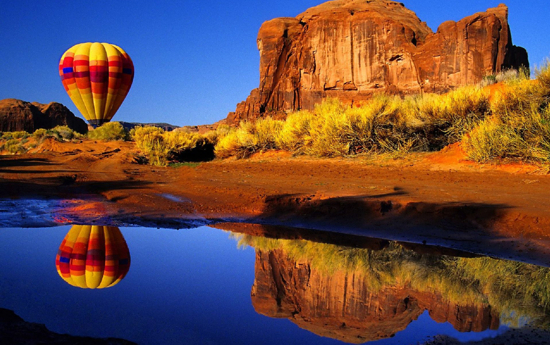 Caleb turned his head to look into the valley, and sure enough, a hot air balloon; bright colorful dot on the rugged desert landscape, was inflating. Caleb’s rational mind had so many questions. His brain wanted to pick apart everything the Oldster said, everything that was happening and analyze it right down to the minutia. But that was his mind’s attempt to blur the moment, to procrastinate. No time in Caleb’s life ever required more concentration than now. All the horses were eager to run, but only one was looking right at Caleb as if she knew him. Caleb looked back to the mountain’s crest. Of course. It wasn’t the dust of riders. That was a desert storm. Caleb chose the horse that chose him. She took the bit without hesitation. He swung up and over her back, and with merely a nudge of his bare boots into her flank, she shot off so fast she nearly left him behind. Down the mountain they went, watching only the switchback trail rushing toward them. The Horse had a mind of her own and was quick to react and act, so Caleb didn’t need to steer her clear of the treacherous dangers of the path, he only needed to hold on. The balloon ahead was upright and expanding. It would be rising soon. He had to reach it before it was beyond reach. As fast as they rode, sound was still faster, and Caleb could hear the thunderstorm, and the horsemen behind them. They weren’t gaining, but they weren’t falling behind either. Yet through all of this, every bit of it, Caleb was a man of reason. His rational, curious mind reeled with unanswered questions and demanded that he stop and analyze everything: Pick it apart and figure it out. A part of his mind told him he was really still back in a dry river bed, dying from exposure and dehydration. No immortal ‘Oldster’ had come to save him. All of this was sunstroke hallucination. His horse, which he hadn’t bothered to name in his rush, began to slow from exhaustion. The sound of his pursuers grew louder. The riders were fast approaching. Caleb was pursued by no ordinary cowboys, but heatwave hell furies riding out of the mouth of morning’s dark from a Lewis Carroll nightmare. With fear’s icy panic, Caleb brought all of his knowledge to the fore. Instead of questioning anything, he forced himself to answer everything. A part of his mind, as if a distant observer, dismissed his words as cornball. ‘You’re smarter than that,’ it sneered. Yet Caleb shouted down his doubts even louder. “The perfect Omnivore can be created by nothing more than a few thrown switches on the spiral ladder!” he shouted. Caleb’s yelling on the outside beat down the negative nattering voices within. His horse ran faster, making time. The bow was sprung and the arrow of death flew toward his heart. Now was not the time to question but do. With immortality, there would be time enough to research all of this: pull the veil of mystery from the truth. Somehow, some way, with some one, the primitive creature that was the Oldster, made a deal for immortality. Eventually, it outlived everyone it ever loved, then everyone it ever knew. Then everything it ever knew, and eventually its own species. It saw another dominant species rise and thrive and eventually die. It saw humanity rise and thrive. Everything was eventual. Even the loss of hope: Caleb felt it with the Oldster. There was no human definition for the word ‘Alone’ as acute as the very presence of the Oldster. Just learning what it endured in a life that spanned hundreds of thousands of years had, according to the creature, put every other human off the idea of its proffered gift. They chose instead to welcome death. But not Caleb. His desire for knowledge, to see what was on the other side of everything, understand it, know it, and create from it, was unquenchable. “My thirst is unquenchable!” Caleb shouted. Thunder from behind. The lightning strikes and rider’s hooves shook the very air in shockwave. Caleb laughed out loud at his terror. As Horse and Man, they moved swiftly across the valley floor, toward the river and balloon. So concentrated was his focus, that sometimes it felt as if he, and not the horse, was running across the valley floor on two legs. Then, just as swiftly, he could feel all four of his hooves galloping across the desert. Caleb laughed again and they gained speed. Yet as Caleb looked toward the balloon, he saw it skirt a bit across the ground. It was so light now that a mere errant breeze could move it – and it moved farther away. Soon it would be rising beyond his reach. Caleb kicked his boot heels into his flanks – the horse’s flanks – their flanks. So it was that Caleb, man and horse, rode furiously toward water and clear blue skies: as eternal youth slowly rose before them, and death thundered from behind. Photograph: Photographer Unknown. Stock image available for free at My-Walls.org. Music: Ghost Riders In The Sky. Performed by Johnny Cash. Penned by Stan Jones.